Reward your users for solving CAPTCHAs. 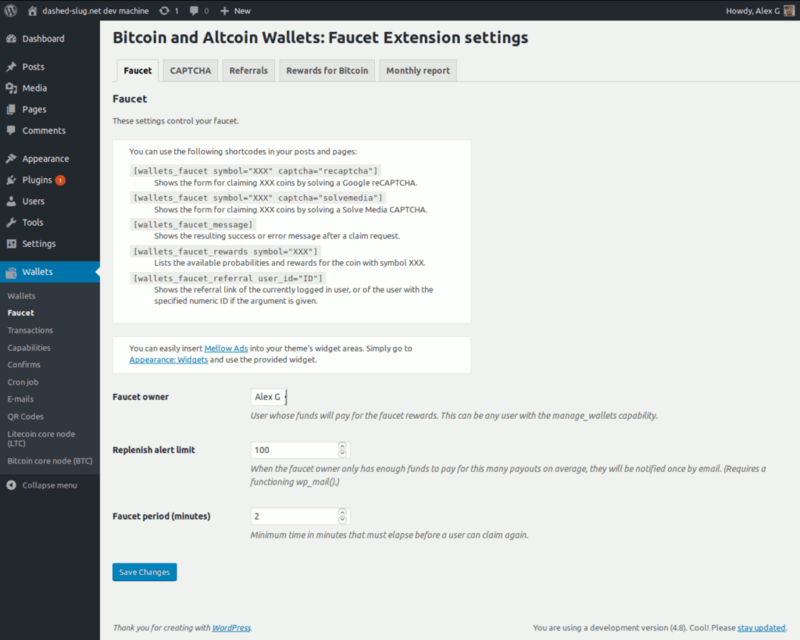 This plugin extension provides Faucet functionality on top of Bitcoin and Altcoin Wallets. Faucets are web pages that reward users for solving a CAPTCHA. You can read more about faucets at Wikipedia. Usually faucets display ads, and the rewards given are a fraction of the ad revenue that a faucet page generates. Ad networks such as google ads explicitly forbid faucets, but other ad networks such as Mellow Ads or CoinAd are fine with faucets and in fact many faucets use these networks. A faucet can be profitable if run correctly, or you might decide to run one simply as a means of paying for traffic to your website. You are in control of the rewards per each cryptocurrency that you offer, and you control the frequency with which people can claim from your faucet. Control rewards per cryptocurrency. Set the payout amounts and associated probabilities. Control the claim frequency of the faucet. Display faucet claim button using shortcodes. Choice of Google reCAPTCHA or SolveMedia puzzles. Widget integration for Mellow Ads. Graph display of daily payout and referral amounts for the past 30 days. Faucet owner is notified by email when reserves for a cryptocurrency are running low. 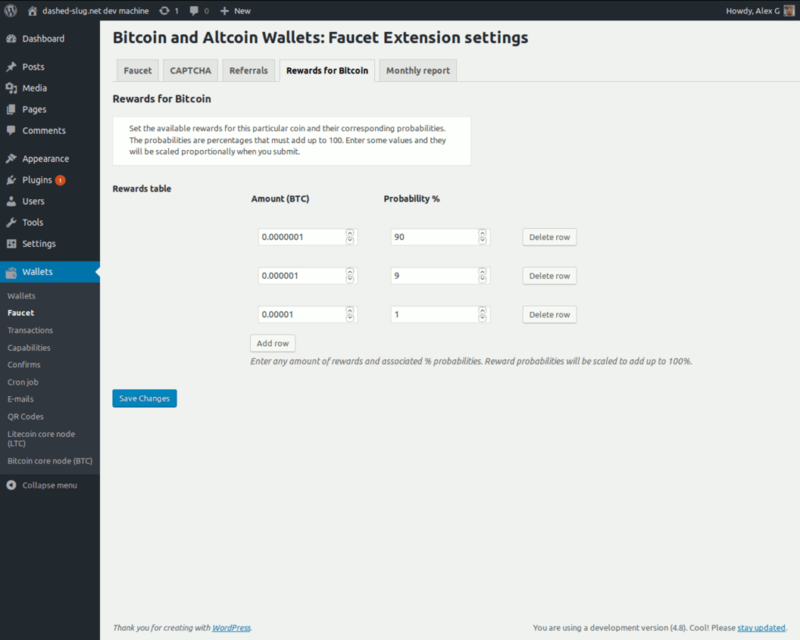 Install and activate Bitcoin and Altcoin Wallets and (this plugin). 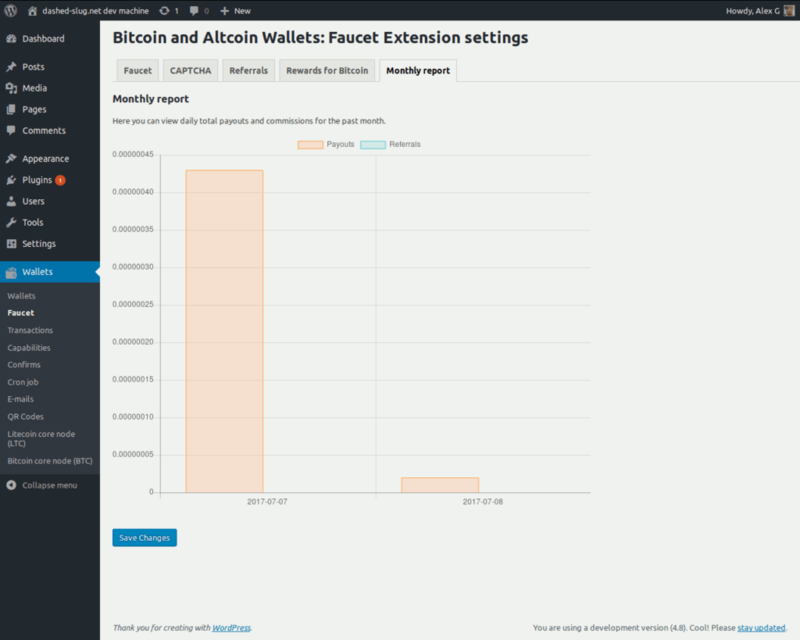 From the left-hand side menu, go to Wallets → Faucet. Go through each of the available tabs and configure your faucet parameters. 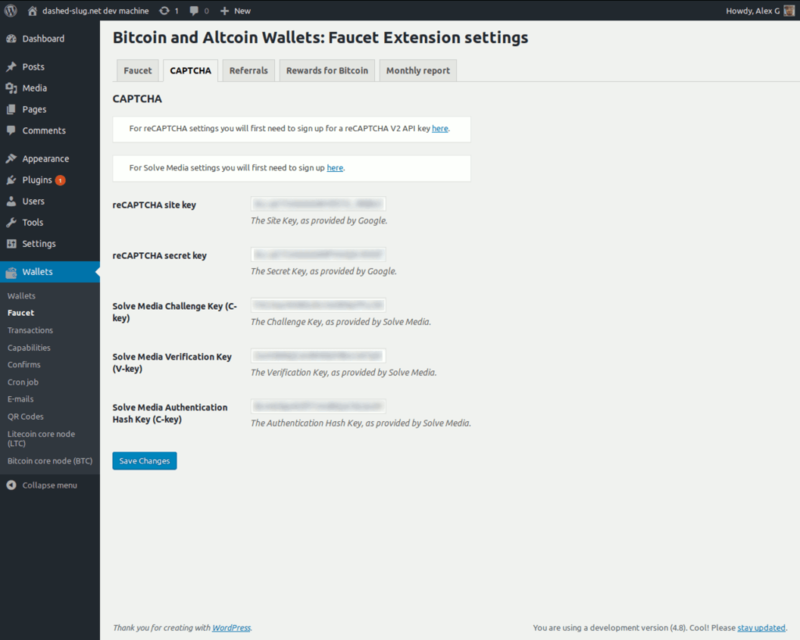 Read the on screen instructions on how to use the provided shortcodes to integrate the faucet into your site. You may use either Google reCAPTCHA or SolveMedia puzzles or both. 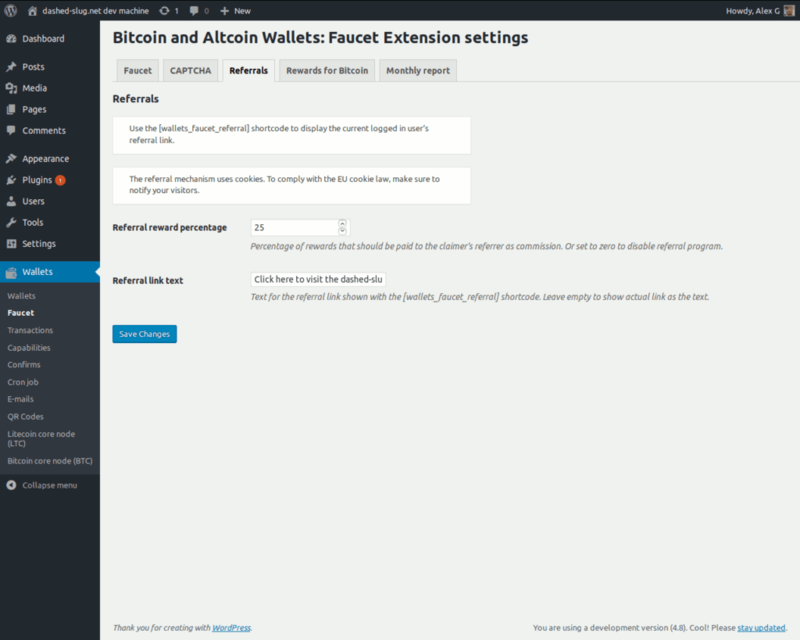 Once you have selected a faucet owner, which can be any user with the manage_wallets capability, make sure to deposit currencies to that user. The rewards that your visitors claim will be subtracted from the faucet owner’s balance. The faucet owner will be notified by email when reserves are running low. Optionally integrate with your MellowAds account to display ads. You can go to Appearance → Widgets and use the provided MellowAds widget in your theme’s widget area. After registering at dashed-slug.net you will have received an activation code in your e-mail. In the provided text field, please paste your activation code exactly as you received. Updated on 2018-10-30T17:43:25+00:00, by alexg.